Pacific Marquis carries superior pool and spa water purification products. Pacific Marquis carries superior pool and spa water purification products. Filters compatible with Pacific Marquis, along with many others, are available for our customers through the Filters Fast website. 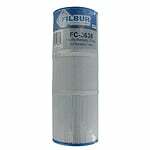 The Filbur FC-3638 is a compatible replacement spa filter for the old style Pacific Marquis spa filter. This compatible filter replacement will fit all spas, jacuzzis, and hot tubs which use the Pacific Marquis Spa Filter.